I received an email yesterday from the owner of the rescue centre we got our dog Alf from earlier this year. It is an invitation to their annual summer barbecue to which all the people who have adopted a dog are invited to. Unfortunately, we won't be able to attend as we will be away on our 4 days trip to Yorkshire and Glasgow (very excited!! Can't wait!!) but I thought I would write a short post to recommend this rescue centre in case one of my readers is thinking of adopting a dog. The reason we chose to go the New Graceland , a private rescue centre, was because it is specialised in rehoming greyhounds and other hounds retired from racing or hunting. 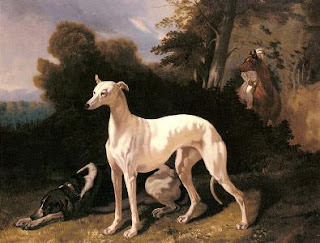 I looooove hounds, I think they make the most beautiful dogs and always wanted to own one. I also think that paying ridiculous amounts of money for a puppy when so many young dogs deserve a second chance in rescue centres is not for me. I can understand why some people would rather buy a puppy than an older dog (although think of the advantages of getting a dog that is already toilet-trained...priceless! ), but I do think that the amount of money some breeders are charging for puppies is criminal. Anyhow, I wanted to adopt a greyhound and New Graceland is one of only two approved greyhound rescue centres in Switzerland. Well, some people say that you don't choose a dog, a dog chooses you and that's what happened with Alf. To cut a long story short, we came home with a dog that couldn't have been more different from a greyhound! However, I would really recommend New Graceland (Stöcken 5, 8865 Bilten GL) to anyone looking to give a dog (greyhound or not) a second chance in life. Evelyn Bader who runs the place obviously loves all the dogs living at the rescue centre very much and her team of helpers make sure that the dogs get a healthy dose of walks and cuddles. The dog kennels are clean and not overcrowded, the greyhounds live in the house with Evelyn and occupy any vacant sofa or bed, and there is a large fenced outdoors playing area where the dogs can run freely and play together. All dogs are healthy, come with all their vaccines/health checks, have a micro-chip and a pet passport. We have been, half-jokingly, talking about the prospect of getting a second dog... although it would financially cripple us at the moment. We must stay strong and resist temptation!!! If any Swiss reader wants to adopt or sponsor a dog...consider helping the fabulous dogs at New graceland! Oh I totally agree with getting pets from rescue centres... I daren't go to any near us in case I would want to take some more home..!